Peter Czarnomski, Director of Estates, recently hosted the AUDE Conference 2018 (Association of University Directors of Estates) on behalf of the University of Kent. This high profile event provided an opportunity to showcase the Canterbury Campus to more than 140 Directors of Estates across the sector. Sibson Building provided an outstanding conference venue and over three days delegates heard from a number of high profile speakers. Speakers at the plenary sessions included: PY Gerbeau, serial entrepreneur famously the ‘saviour’ of the Millenium Dome; Dame Heather Rabbatts, former Chief executive of the London Borough of Lambeth and the first woman to sit on the board of the FA, who presented alongside Sahar Hashemi, OBE, and co-founder of Coffee Republic; Jim Lawless, author of Taming Tigers and the first Briton to dive below the 100m barrier on a single breath of air; Roger Martin-Fagg, Economist and Rob McClatchey, Chairman of UPP Group Holdings Limited, who presented The possible financial outcomes of Brexit and how they might impact on the HE Sector. Admiral Sir Trevor Soar, Chairman of The Historic Dockyard Chatham, gave a unique insight into a TRUE Leader, Meeting the Challenge. The final morning of the conference saw a highly entertaining presentation from Stephanie Davies, co-founder of Laughology the nation's most talked-about training and development programme, and finally, Sir Ranulph Fiennes closed the conference with an awe-inspiring journey through just two of his epic expeditions across the past 40 years. The highlight of the conference on Tuesday night was the AUDE Awards and Gala Dinner at Canterbury Cathedral's Chapter House, hosted by writer and broadcaster, Gyles Brandreth. 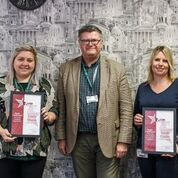 The University of Kent, Estates Department saw two members of its team recognised as Highly Commended. 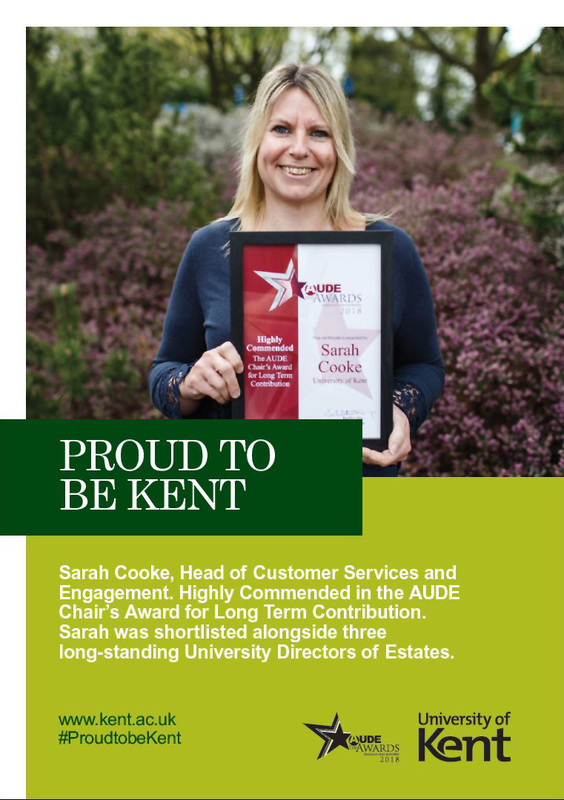 In the category AUDE Chair's Award for Long Term Contribution was Sarah Cooke, Head of Customer Services and Engagement. Sarah is an excellent example of someone who has continually developed their role and sought to contribute more and more both within the Department, to the University and to the local community. Having joined the Estates Department in 1989, Sarah was shortlisted alongside three long-standing University Directors of Estates. 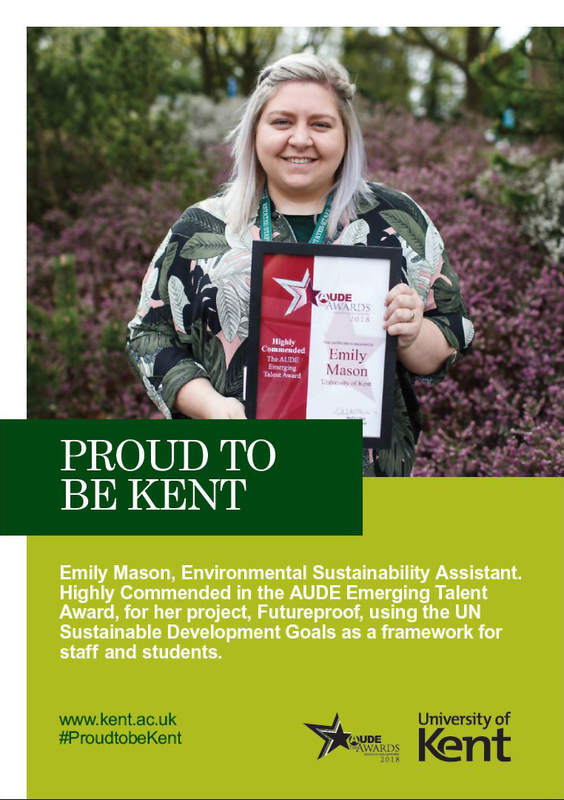 Emily Mason, Environmental Sustainability Assistant, received the Highly Commended Award in the category of The AUDE Emerging Talent Award, for her project, Futureproof, using the UN Sustainable Development Goals as a framework for staff and students from across the University to assess the impact of their activities and create bespoke, targeted action plans to improve. By developing Futureproof, Emily has delivered something with far wider reaching impacts than we had ever envisaged. Simon Fanshawe, OBE, co-founder and partner of Diversity by Design, expertly steered the conference through to a successful conclusion on Wednesday morning. The AUDE Conference 2019 will take place at the University of Lancaster (University of the Year 2018). This event was organised by Assured Events, Manchester.